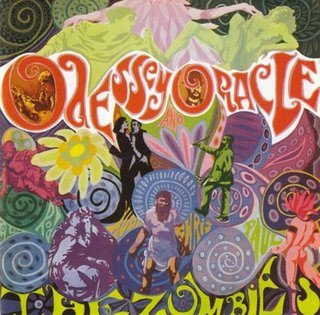 Just a personal recollection: when i first bought "Odessey" around 1986 I was in the middle of discovering 60s American Garage Punk, without ever forgetting my favourite, UK Psych and obviously what came just before...therefore the Zombies were real favourites of mine but I was kind of puzzled a little bit by what was supposed to be their masterpiece. maybe i had been listening to too much Count V, Electric Prunes and all that! still, i kept playing it and got more and more into it...eventually I bought myself a better copy, what i had bought that first time was a reissue that had a truly horrible sleeve, it looked like a heavy metal album: criminal when i think about it! i wonder if its ugly face does show up in the net...under "worst sleeves ever" of course! How did you like the Parade? i don't know it at all, visited the blog though...the very first FADING YELLOW is one of my faves (got the actual LP)...not so much some of the other volumes or series...not everything works for me...or it's like too much "sugar" at once! When I was still a teenager I had a Rock Roots compilation of the Decca stuff which I played to death but I never got to hear Odessey until I got the wonderful Zombie Heaven box set in 1997. The Odessey disc is definitely the most played of the four! The Parade is pleasant enough sunshine pop but nothing really to write home about. You're right about Fading Yellow - sometimes all that sweetness is just too much but it's nice to dip into once in a while.